What was practically unthinkable at the arrival of the Geforce 9600M GT graphics card is now no longer a problem. LG packs this Nvidia performance-oriented mid-range graphics card into a compact 13.3" enclosure and as a result creates one of the highest performing compact Multimedia notebooks. Even if the P310 was introduced as a business laptop, gamers will arguably show the most interest in it. LG is to release two 13.3 inch Notebooks with the pointless-sounding names "Tarsia" and "Camini", which are also small towns in the Italian Calabria , which differ only in RAM, processor and hard drive options. The P310 Tarsia includes an Intel P9500 CPU as well as a 320GB drive drive, and as the most powerful of the two has a retail value of around 1400 Euro. 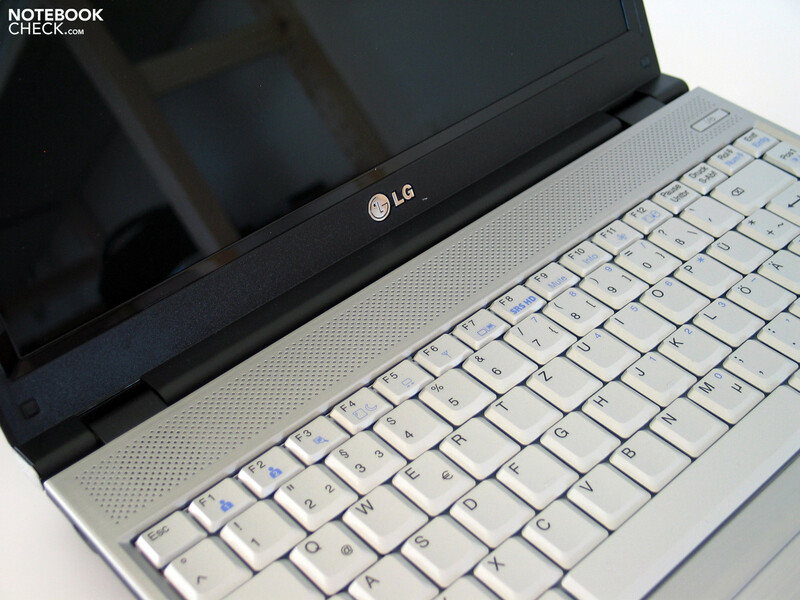 The current LG P310 Camini is "only" equipped with a P8400 CPU and also offers a smaller 250GB hard drive. However the Camini retails somewhat cheaply at roughly 1200 Euro. 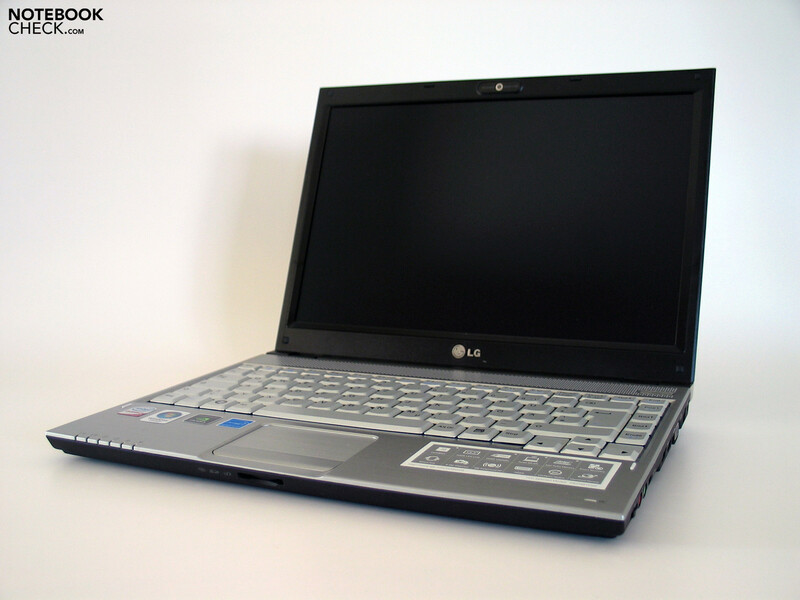 Connoisseurs of LG Notebooks are familiar with the straightforward form and the overall geometric design that we also find in the P310. In combination with with the extremely flat base unit the tastes of many potential customers are ensured to be met. This is also true for the colouring of the case. Whilst the notebook is predominantly black with the lid closed, with the display open the silver surfaces of the base unit and the matching silver keyboard are pleasing. The high-quality of the materials gives a very positive impression of the system as a whole. A mix of plastic, magnesium and aluminium components are employed, which are partly just for decoration. Despite the rather thin base the LG P310's case achieves a considerable stability. The case's high rubber feet keep it in place without the slightest movement. The results are also good for the lid. Even the thinnest display resists pressure - and even when bent the display help up. While the screen can only be opened to a maximum of 155 degrees, this allows for a limitless mobile workspace. 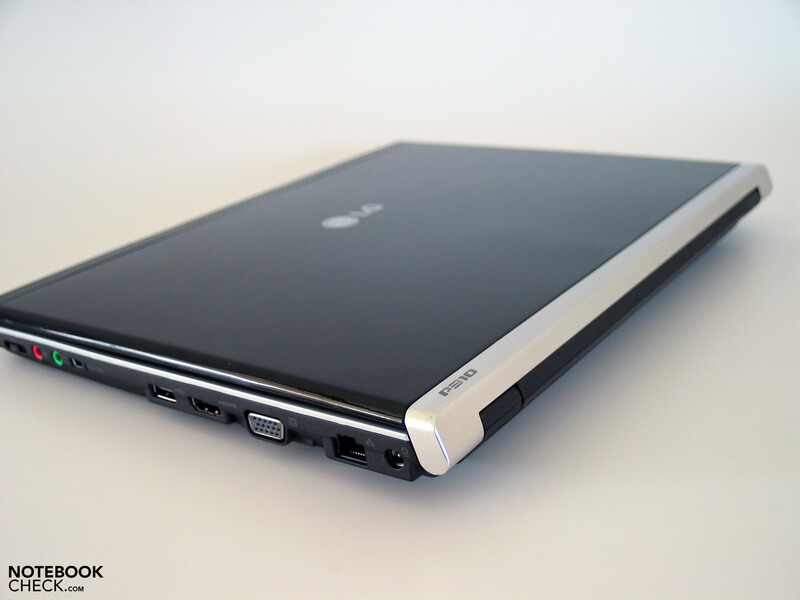 The hinges on the display seem thoroughly robust and keep the slim 13.3 inch screen sturdily fixed in position. However, a very slight sway could be noticed in the screen for the review. It's also worth mentioning that the P310 no longer comes with a locking mechanism for the display. In our opinion the hinges are strong enough to ensure that the screen isn't accidentally opened when shut. During transport, however, the notebook should still be stored separately. In the LG P310, not much space remains for possible connections, as the base unit is extremely flat. 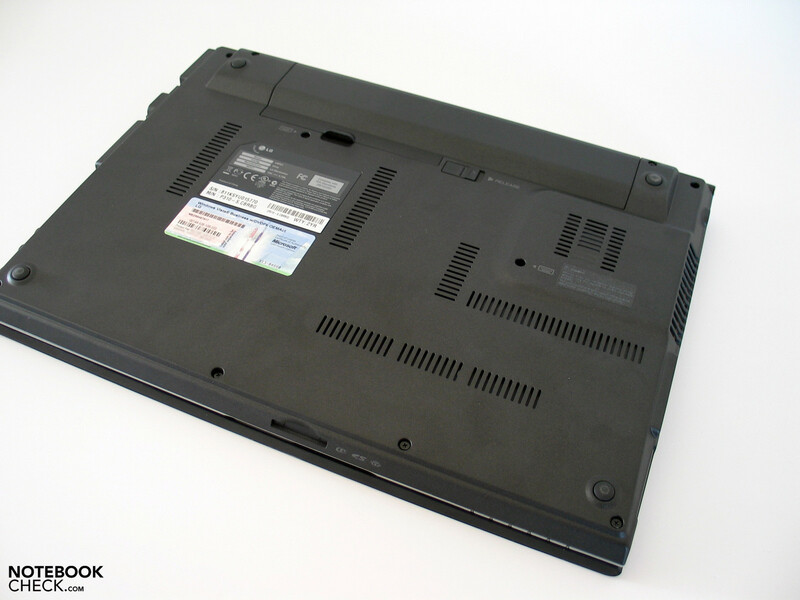 The back of the notebook has no possible connections due to it being taken up by the folding mechanism of the display. At least the small front of the case houses the card reader, which takes the load off the side connections. The laptop is however somewhat covered in terms of interfaces offered. 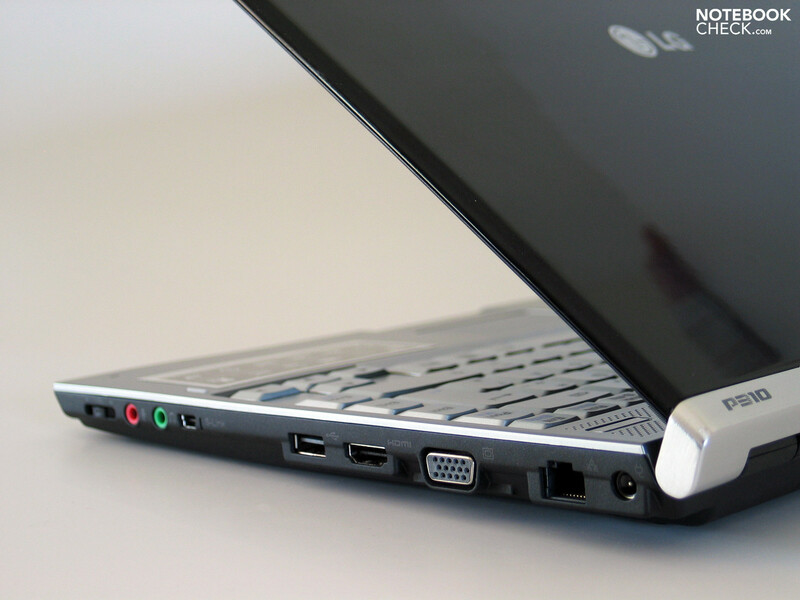 The laptop has 3 USB Ports, VGA and an HDMI Port, as well as a LAN interface and a LG Smart-Link Port. 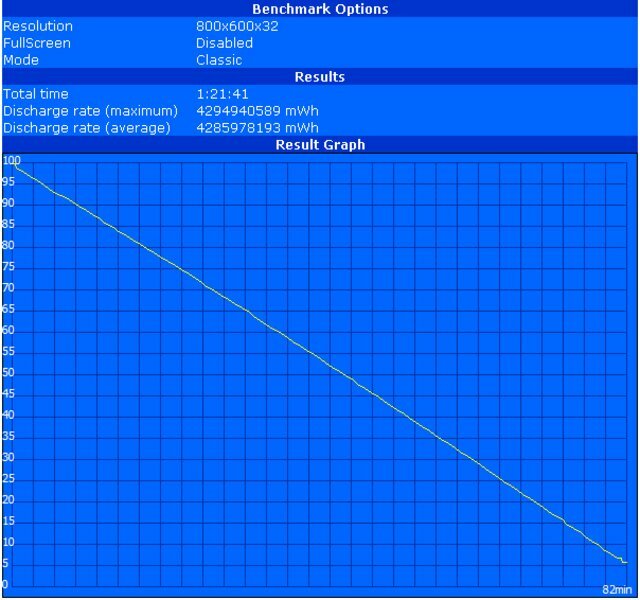 This primarily serves the purpose of directing data between two computers. The necessary software for this is also included. During the review we weren't entirely pleased with the positioning of the various interfaces. 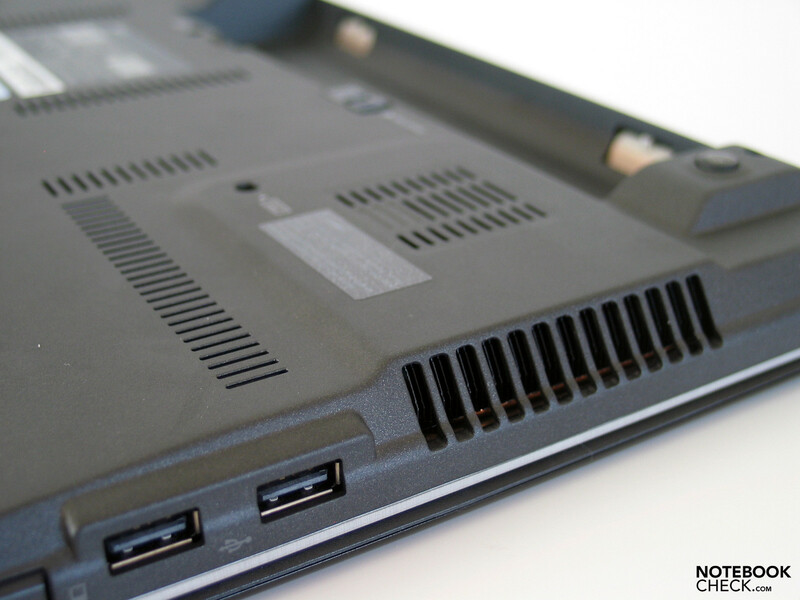 There are some USB ports on the sides on the front half which are particularly uncomfortable during extended use. 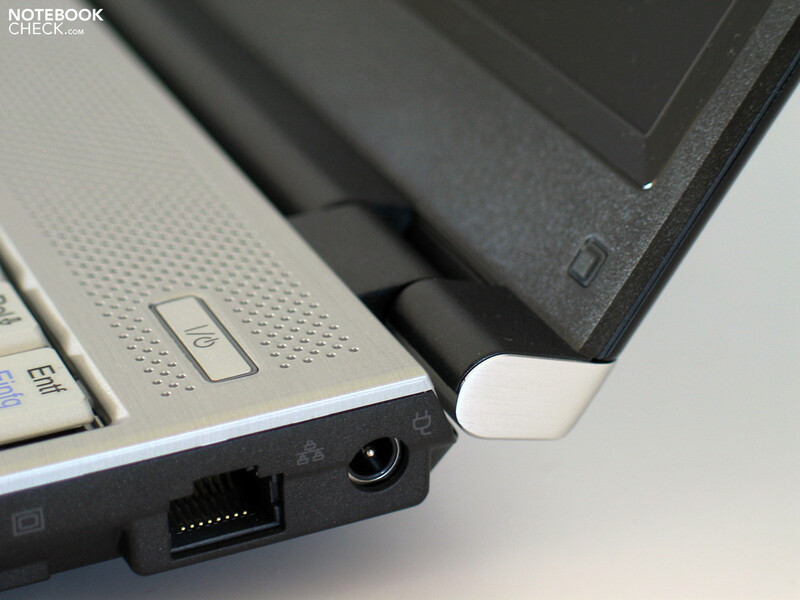 Since the LG P310 has no docking interface despite its compact form factor and its orientation towards businesses, it is surprisingly only possible to use a commercially-available USB dock. 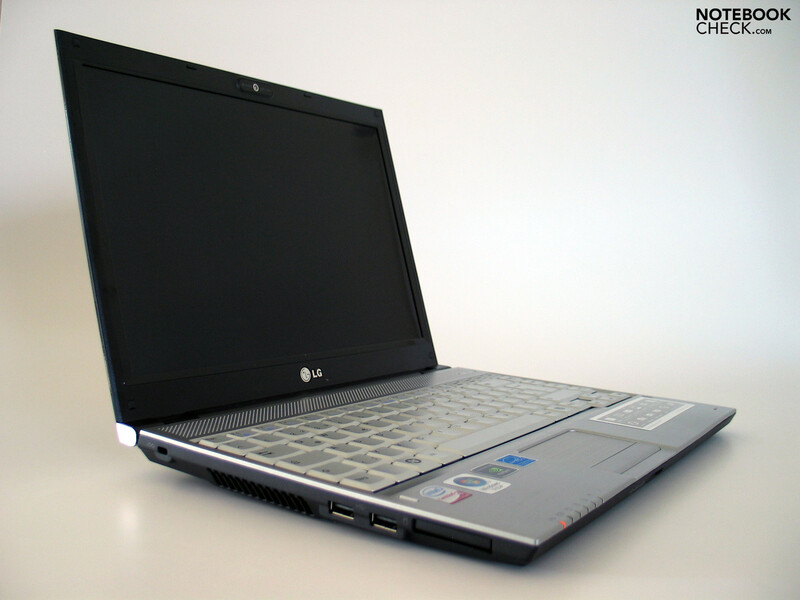 If you connect the notebook to an external monitor, which in view of the small 13 inch display in WXGA format and the highly capable graphics hardware is highly probable, you will find that, as both the HDMI and VGA ports are relatively far forward, the area right next to the laptop is unusable. This is particularly relevant for right-handed people. Conversely those who are left-handed have to deal with the opening for the fans on the left edge, which ensures warm fingers even at the most arctic temperatures. LG makes no compromises with the LAN and Wireless LAN hardware. Firstly the 10/100/1000 Mbps Gigabit LAN provides a powerful connection to your wired home/office network, the state of the art wireless Intel WiFi Link 5300 AGN Module provides the other (with a maximum transfer rate of 450 Mbps). The built-in Bluetooth V2.0+EDR module could be useful both for business and home users. This means that wireless communications to various other devices is no problem. Since the LG P310 lacks an integrated optical drive, LG provides users of the ultra-portable device with an external DVD drive (DVD Multi-Recorder). 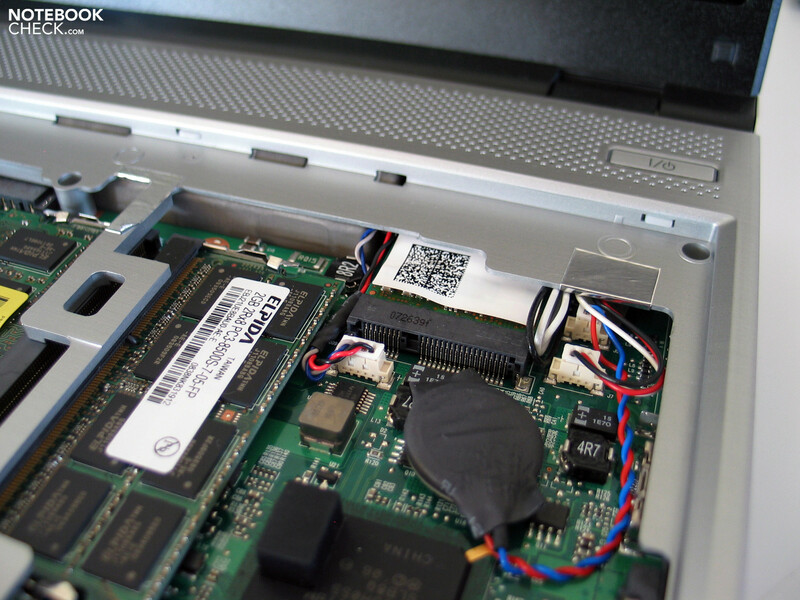 This is connected to the laptop using a rather short USB cable, and is powered on when needed by the notebook. 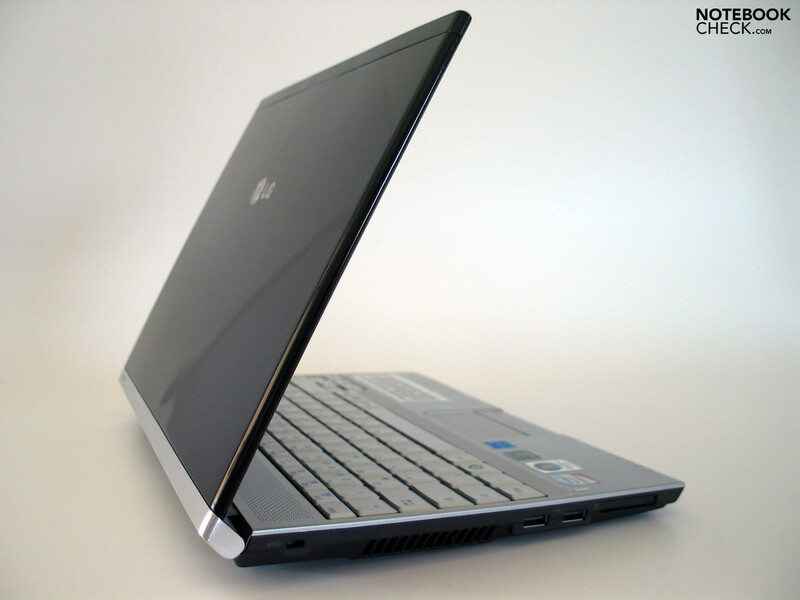 Windows Vista Business AND Windows XP Professional can be supplied with the LG P310 as a special service. 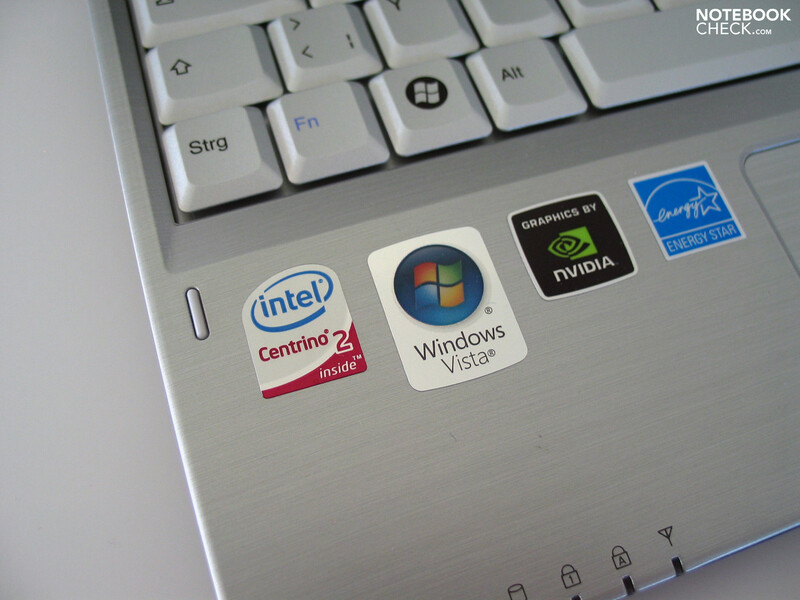 This is part of LG's desire to give many business and private users who are still, in many cases rightly, attached to Windows XP the freedom not to be tied to Vista when buying a new notebook. In comparison with the competition, LG's 24 month warranty is well served with its "Collect & Return Service". In case of damage, the defective unit is picked up and is re-shipped to the user after repairs. An optional 3-year warranty extension is possible, to be activated within 90 days of purchase. This costs around 75 Euro, which we consider an acceptable amount. 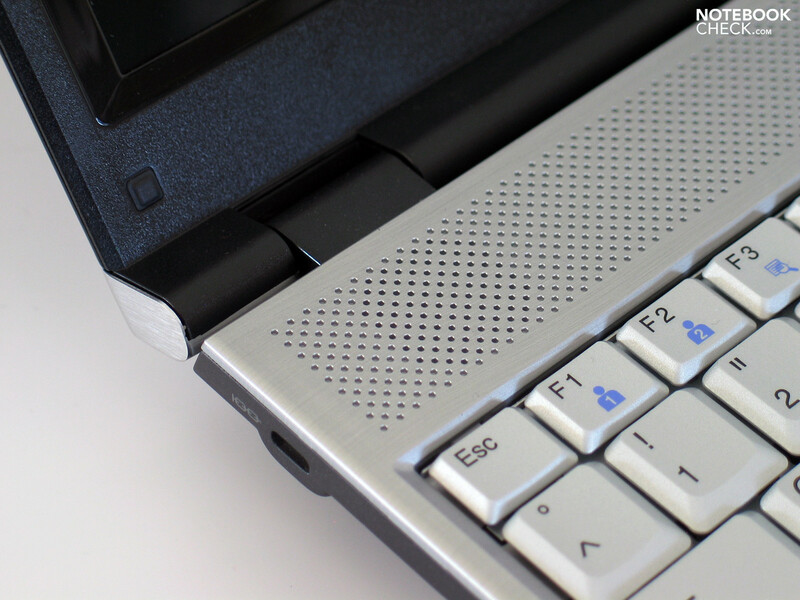 With a case width of 315 mm, the P310 offers adequate space to house a keyboard with ample key size. 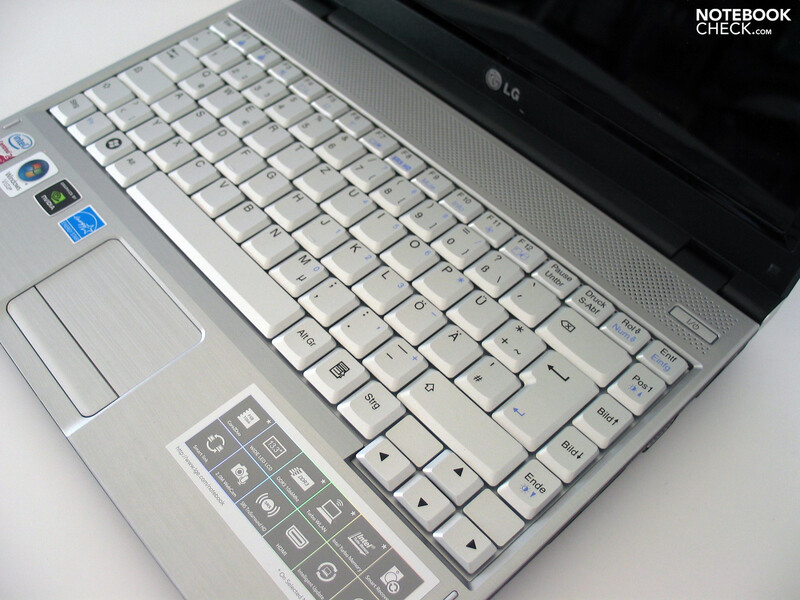 In fact LG uses close to the entire width of the case and allows the keyboard to be positioned, in our opinion, in an extremely user-friendly area of the device. All keys are an acceptable size and the keyboard layout is clear , meaning next to no time is spent getting used to the device. The feel of the keys is convincing. With a comparatively short stroke and rather low resistance but a concise enough pressure point, the keys allow for extensive writing such as assignments. Particularly positive is the pleasant background noise whilst typing, even with more energetic typing. 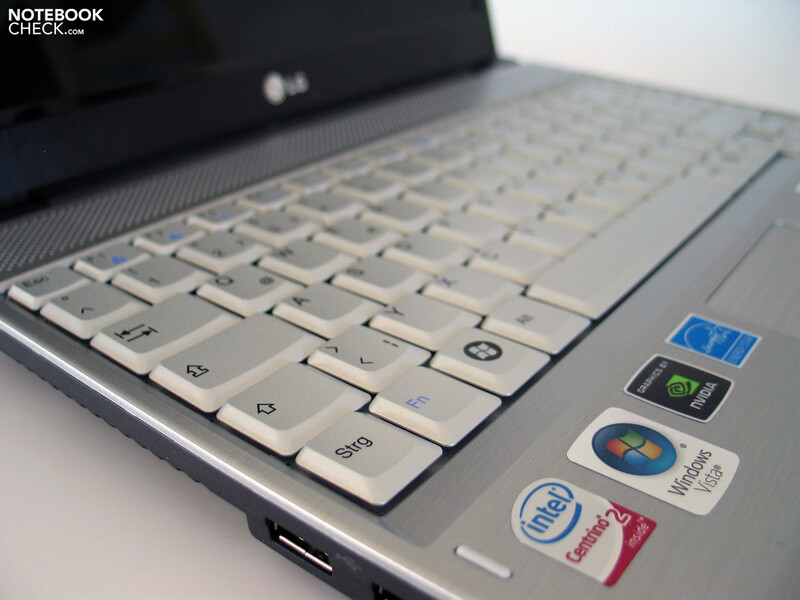 Like the entire keyboard, the Touchpad is attractive and fits into the aesthetic design of the LG P310. Despite it being attractive, the Touchpad has a nice interface and such a smooth gliding surface and an equally user-friendly range of Touchpad buttons. There is only the system-dependent dead zone in the middle of the toolbar buttons that give cause for criticism. As previously mentioned, The LG P310 Camini is not only the stronger model of the two but has a 13.3 inch display with LED backlighting. 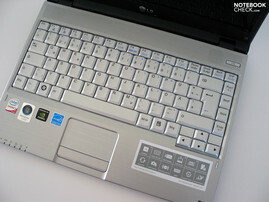 The WXGA resolution with 1280x800 pixels is usual in consumer notebooks and desktops. For jobs with low requirements regarding desktop size you will find that this display suffices. However if you want to work simultaneously with several windows or if you want to use a program with several toolboxes, you will find that the display is too small, irrespective of the display being 13.3 inches diagonally. 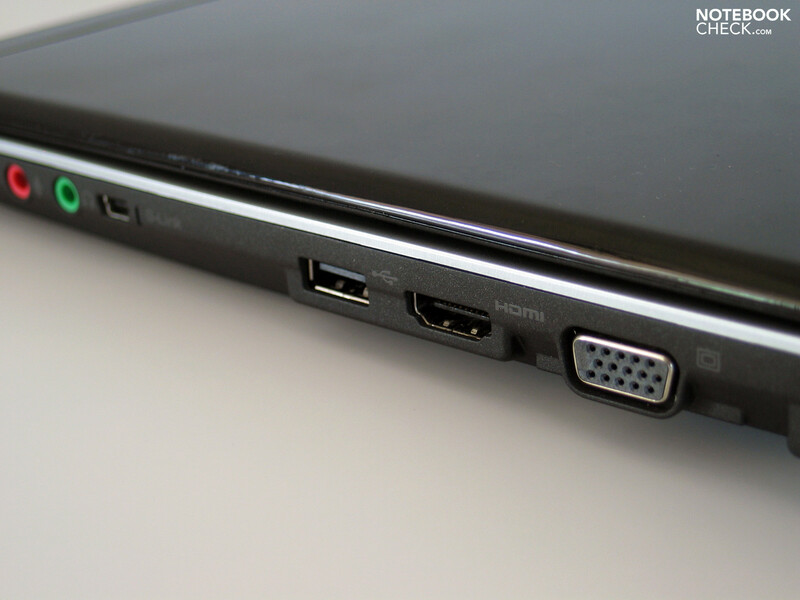 An alternative method here is use of the fully digital HDMI port, with which the notebook can be connected to an external monitor. 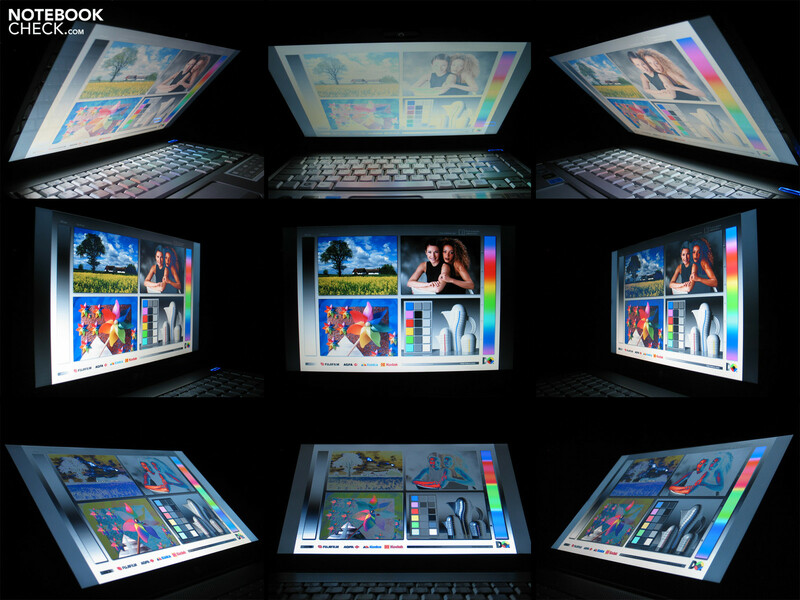 LED-lit displays often offer better brightness and illumination than conventional CCFL displays. 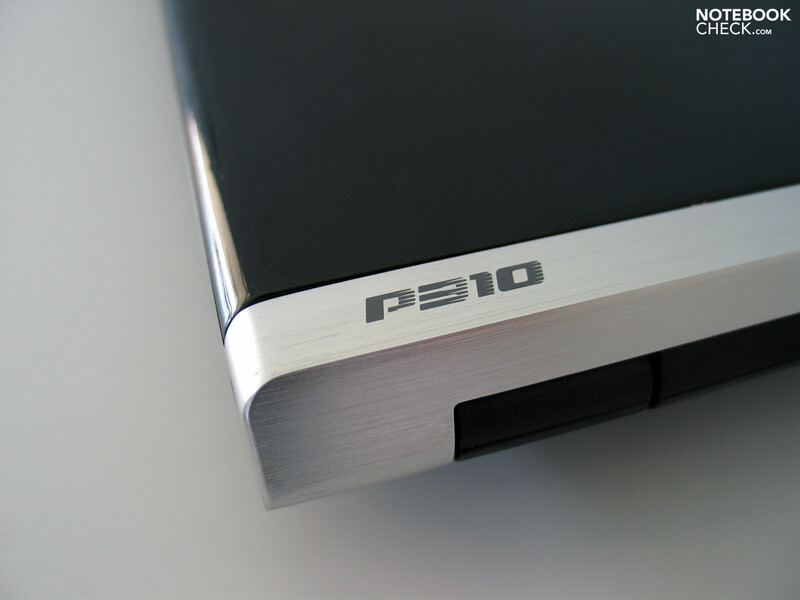 The P310 uses the LED technology to its advantage and offers very good brightness. In the central area of the display the measurements ranged up to 273 cd/m². Since brightness decreases to a somewhat limited extent in the edges of the display (min. 218 cd/m²), the illumination of 79.9% is still ok.
We were somewhat surprised by the extremely high black value of the assembled panel (LP133WX2-TLCA / LPL2201) which with 2.12 cd/m² is responsible for a maximum possible contrast in the central display area of only 123:1. Interestingly, it was the subjective impression of the image that was passable, and the glare from the reflective screen is without doubt a cause. The display also proved to be less useful in use outside. Even at moderate ambient brightness and rather dark display content, there are relatively heavy reflections to deal with on the screen. Under an open sky this extends to only being able to see your own reflection on the screen. If you do find a shady spot in which to use the device, you can work with patience, which is partly due to the good brightness on the display. The possible viewpoints are impaired within horizontal ranges by strong reflections from a reduction of the accessible angles. Vertical viewing angles are somewhat better but still clear deviations to the image occur. Shallow viewing angles also add to the disturbing reflections. 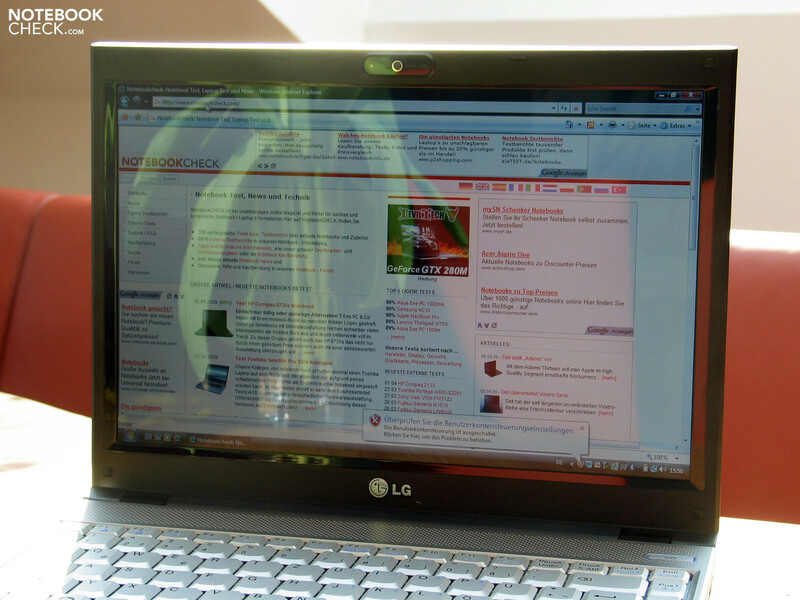 In particular, as the LG notebook is targeted at businesses, we can barely understand the panel's off-putting glare. This is particularly so for jobs where working with the notebook outside would be laborious, and especially in such a compact 13.3 inch this would be an important design criterion. 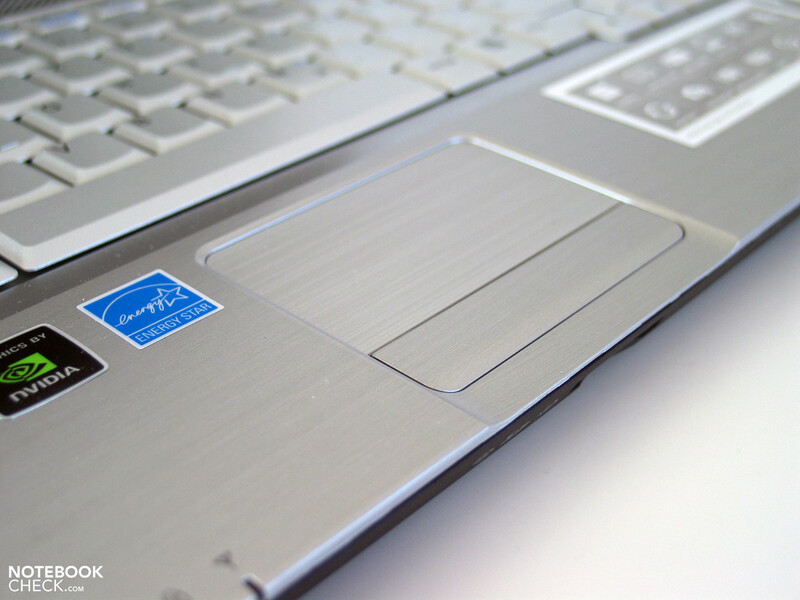 In our opinion, a matte display option should be available to the unit with the more limited CPU and HDD, which would be of great interest to businesses. Consumers, who are primarily interest ed in the performance of the notebook, can undoubtedly live with the mirror-effect of the display, considering the usually better colour presentation compared to most pale matte displays. No matter if you're using the P310 "Camini" or "Tarsia", in the 13 inch case awaits almost unparalleled performance hardware. 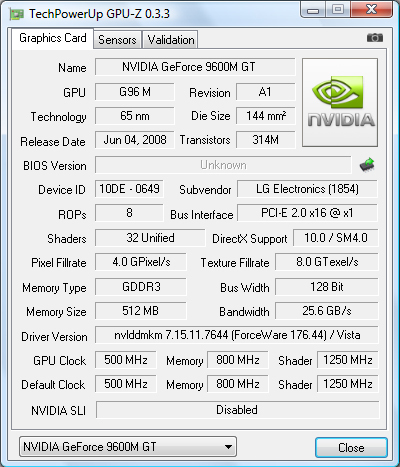 The Geforce 9600M GT graphics card provides such performance, which as a powerful mid-range chip which had been designed for 15 inch multimedia notebooks at its time of release amost a year ago. The fact that this chip is not quite as long as in the lesser models of the 15- and 14 inch units is explained by the power of this particular unit as well as the comparatively high cooling load. The successor to the 8600M GT GPU has DirectX 10 Support and is manufactured in the 65nm process. Additionally, the chipset supports HD video decoding and can be used to that purpose to relieve the CPU. 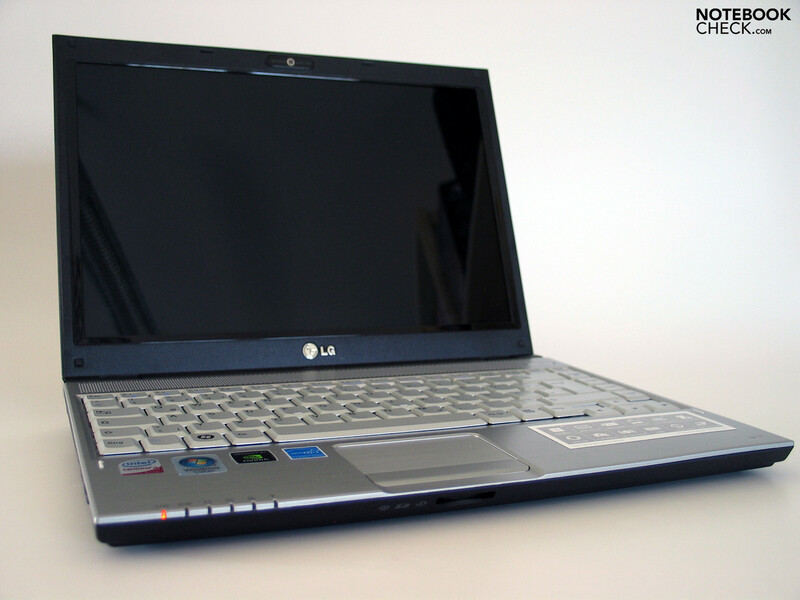 Such a graphics card in a compact notebook like the LG P310 raises the suspicion that the chip would be limited in order to control heat release and energy consumption. But LG allows nothing of the sort. With a core clock speed of 500 MHz with 512MB of GDDR3 memory with a 128-bit architecture, the LG P310's Nvidia Geforce 9600M GT is the standard configuration. 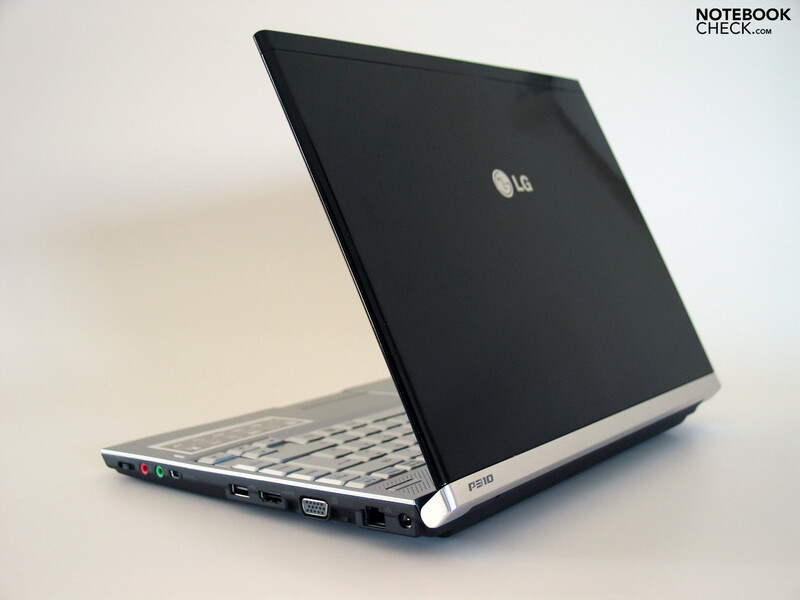 Also the 3D Mark 2006 benchmark test certifies the LG P310's strong graphics performance. 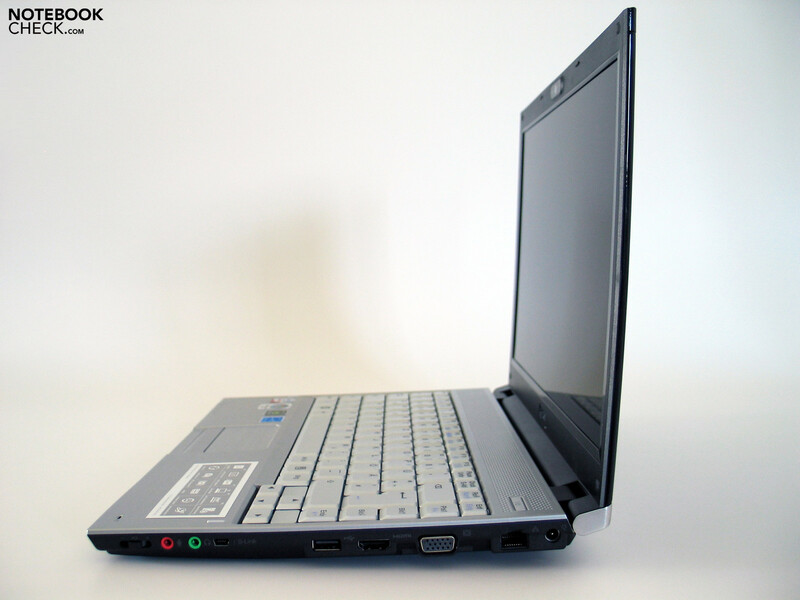 With 5099 points, this compact multimedia notebook is practically on par with the A15 from Zepto Mythos, which is equipped with a Gefroce 9600M GT graphics card with 512MB of GDDR3 memory. This comparision was achieved, as usual, from the 3D Mark 2006 standard resolution of 1280x1024 (using an external monitor). So, the Camini or the Tarsia? This choice will be made depending on your CPU needs and the price difference of around 200 Euro between the somewhat weaker Camini (Intel P8400) and the stronger Tarsia (Intel P9500). 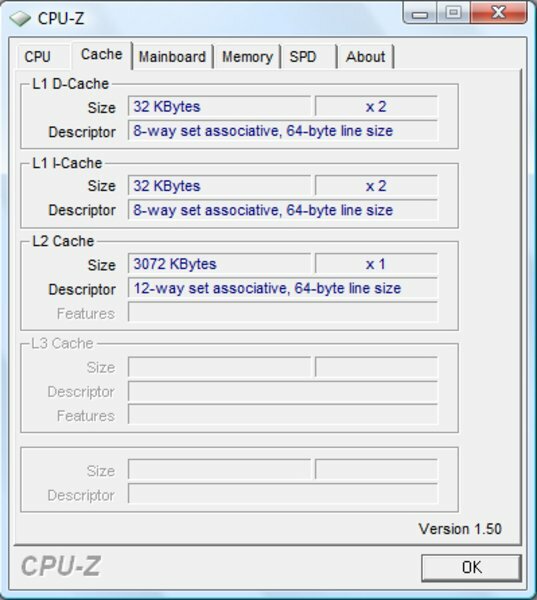 Both systems are dual-core yet the processors differ substantially in the size of the leve 2 cache (3MB to 6MB) and their clock speeds of 2.26 and 2.53 GHz. This is ultimately the reasoning behind the price difference of 209 to 348 US dollars (according to Intel's quote for 1,000 units). 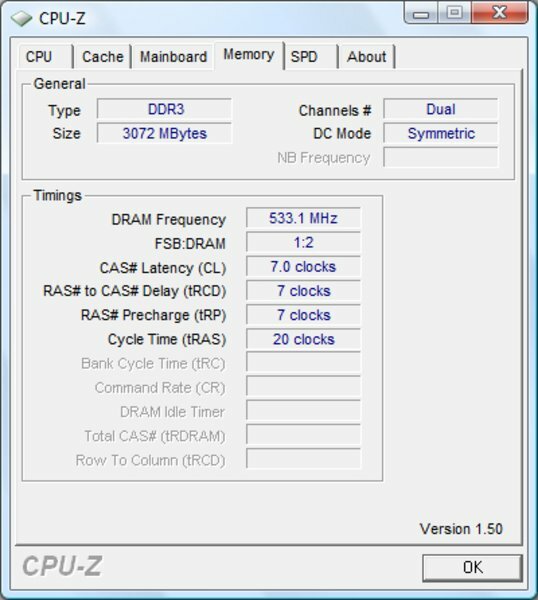 The TDP-value of both chips, which is important for the system's cooling, is 25 watts for both models. 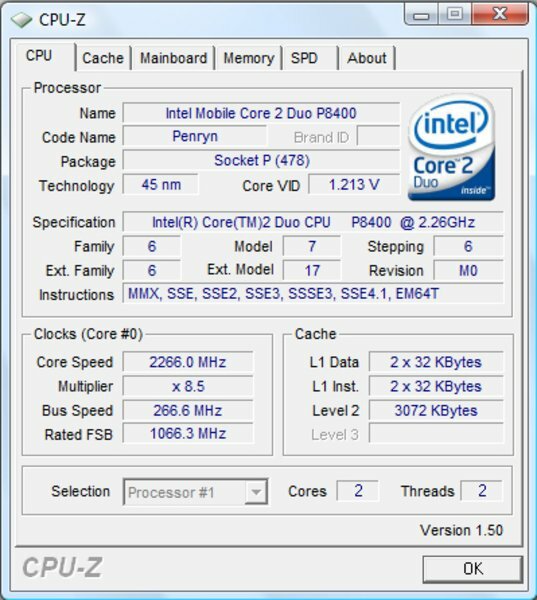 As a part of our Intel Core 2 Duo 'Penryn Refresh' review, we have reported on the differences between various CPUs for some time. In conclusion we can say that in terms of price/performance, the P8400 is better value. In extremely CPU-heavy applications, the P9500 has a clear advantage. 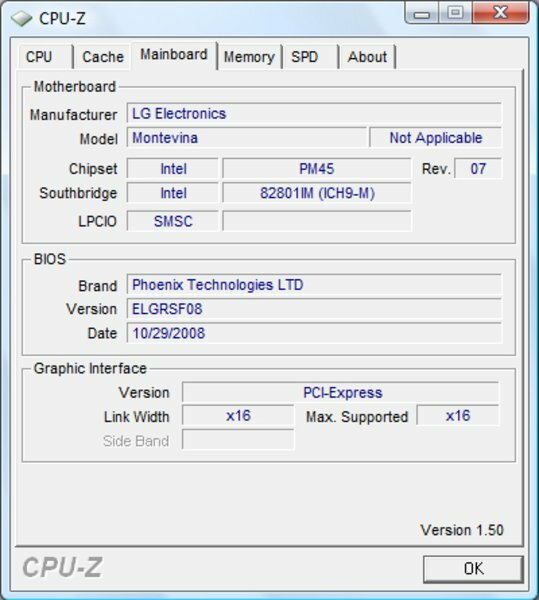 In 0-8-15 Office applications as well as moderately demanding games (of course with the Geforce 9600M GT hardly anything is impossible), you should use the P8400 CPU, which suffices in any case. The Cinebench R10 Benchmarks, certify that our test system (P310 Camino) performs consistently well in the OpenGL shading test. Clearly, however, the P9500 in the Dell Studio XPS 13 shows its performance advantage over the Intel P8400 in our test model. With intensive use of rendering applications, buying the more expensive model with the P9500 is worth considering. 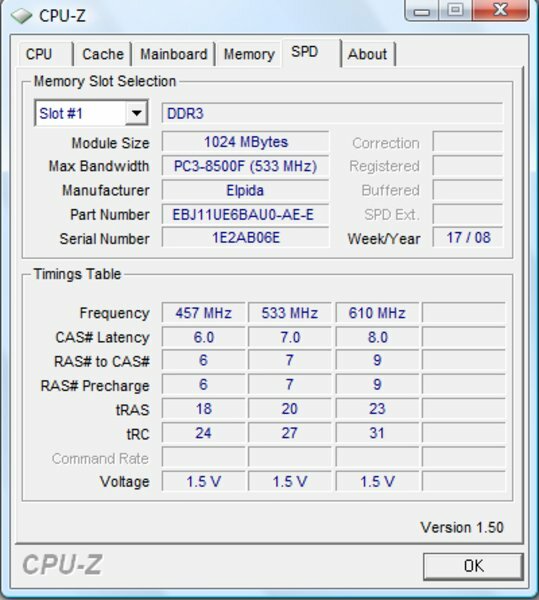 Last but not least, the DDR3 memory gives the P310 an overall good performance for the office. 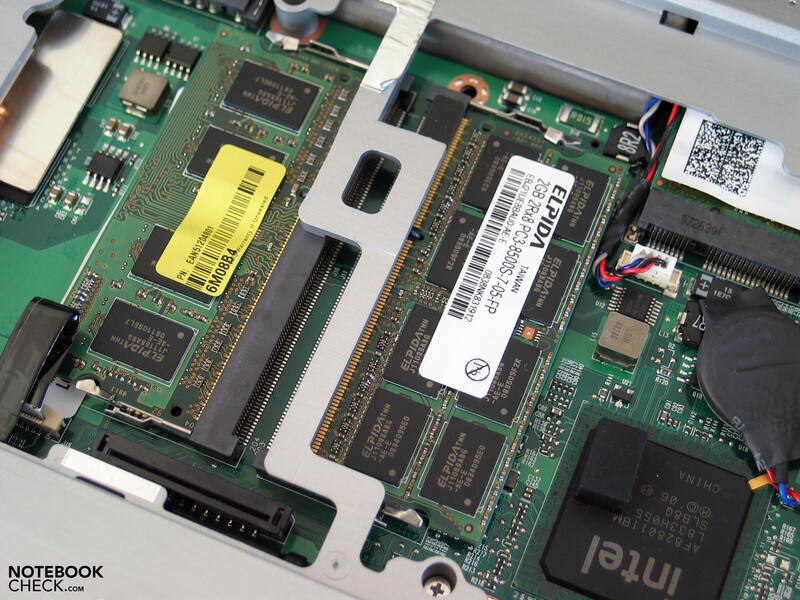 With a total of 3GB between 2 modules, the notebook offers the maximum available memory for Windows Vista Business 32-bit. The Tarsia also goes further in offering a total of 4GB DDR3 memory. The models also differ in their hard drive configuration. While the Camini has a 250GB HDD from Fujitsu (MHZ2250BHG2) with a speed of 5400rpm, the P310 Tarsia takes on an additional 70GB with its 320GB hard drive, also with a speed of 5400rpm. 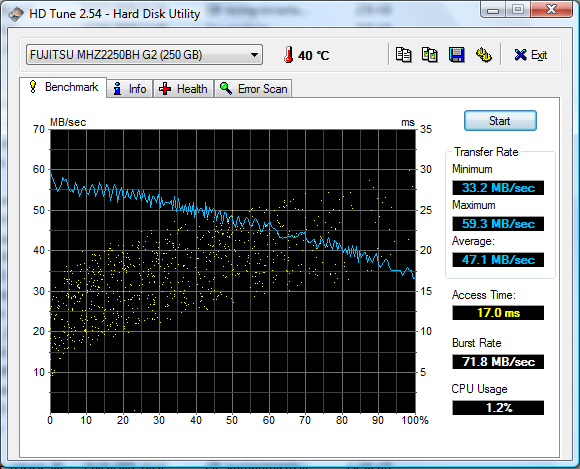 In the HDTune benchmark test, the 250 drive had an acceptable transfer rate of 59.3 MB/sec with a strong access speed of 17 milliseconds. As mentioned before, the LG P310 is attractive to gamers who are looking for a compact and mobile gaming platform because of the Geforce 9600M GT graphics card. 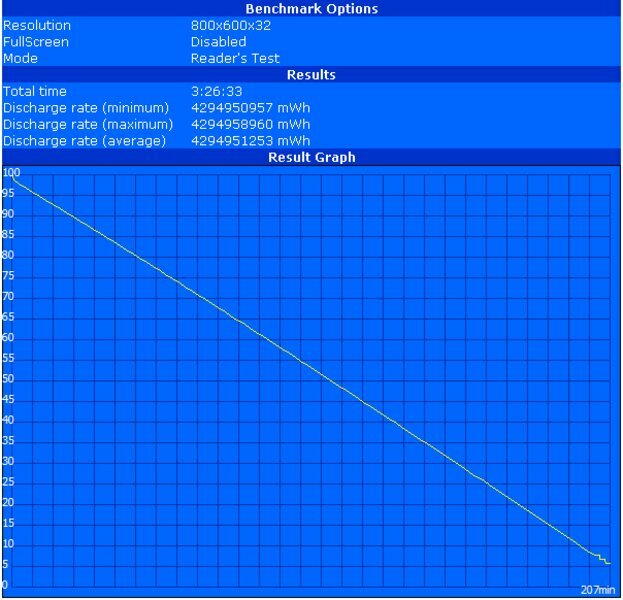 The fact that the P310 performs well even with current games is shown in the tests we carried out. In the action-shooter Call of Duty 4 - Modern Warfare, the tested rig (P310 Camini) reached an average frame rate of 46.9 fps on medium settings, at a resolution of 1024x768, with anti-aliasing disabled. This was achieved at the beginning of the first single-player mission. As a result you can enjoy completely fluid gameplay. Only on increasing the settings to high, with 4x anti-aliasing and a resolution of 1280x1024, performance fell to 25.7 fps. Whilst frames were frequently dropped and there were short bursts of jerkiness, which limited the fluid gameplay experience we had experienced earlier. The current horror-shooter Fear 2 posed no problem to the system. At a resolution of 1024x768, with anti-aliasing and HDR lighting disabled, running at medium settings gave us an average frame rate of 50-60 fps. This too was achieved in the first minutes of the game in single-player mode. Apart from sparse loading screens, which interrupted play, this system promises a fluid gameplay experience. Even in the real-time strategy game Supreme Commander - Forged Alliance the results are somewhat pleasing. In the benchmark test which included real-time gameplay, the notebook managed an average frame rate of 25.094 fps (medium settings, 1024x768, AA disabled). 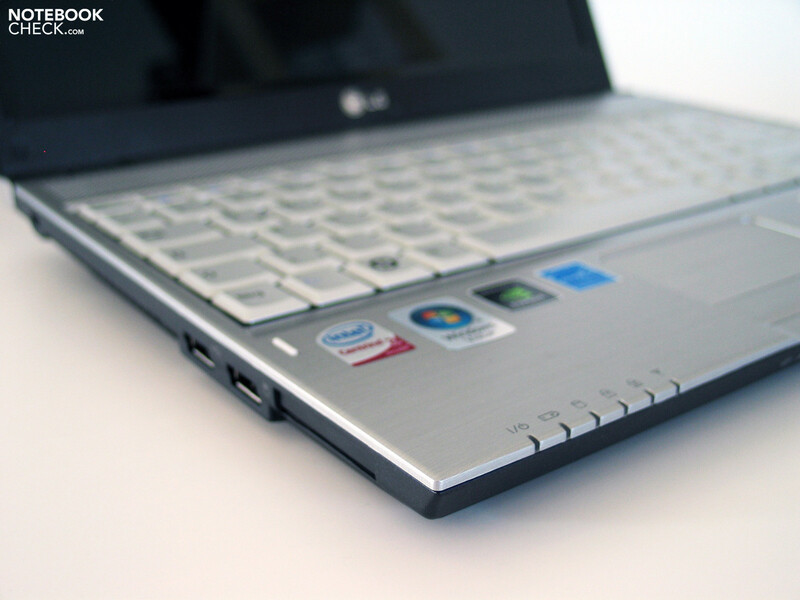 On high detail and 2x anti-aliasing enabled, the notebook achieved 19.8 fps. At medium detail multi-player matches were extremely playable. The P8400 reaches its limits, however, on large maps and numerous AI with many units. Finally we were able to test GTA IV, the current saga in the Grand Theft Auto series, which tests the LG P310 to its limits. Even on the lowest possible settings at a resolution of 800x600 with everything on low, the P310 only managed 30.83 fps. In normal gameplay we observed 25-45 fps at the same settings, which still provides a moderately fluid gameplay experience, however it doesn't permit us to enjoy the otherwise impressive graphics of the game. At medium detail the P310 can still render GTA IV playable, but anything more demanding is not playable. It seems obvious that a comparatively compact notebook with adequate performance hardware isn't light on its feet. Because of this the constantly running fan, even when the system is idle, is not surprising. With a system volume of 34.3 dB(A), the LG P310 Camino is in this case constantly audible but isn't disturbingly so. Interestingly the maximum system noise under a heavy load was relatively low. Indeed, a level of 38.0 dB(A) is quickly reached, however even under a constant heavy load the notebook remains at this comparatively uncritical level. In our opinion we didn't find this maximum level too unpleasant. A quick look at the case temperatures shows that the insides of the LG P310 are busy at work. With a maximum 39.1 °C on the left area of the keyboard, the heat given off by the upper side is limited to a certain extent. However the underside of the case was relatively interesting. Here the P310 reaches a maximum value of 47.7 °C by our measurements, by which it can be extremely unpleasant to make direct skin contact. 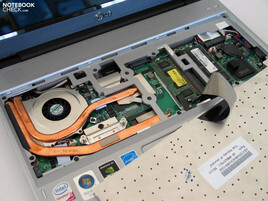 The hot spot in the central area of the left-hand side of the case also shows the positioning of the most important components, such as the GPU and the CPU, which is shown when the keyboard is removed. (+) The maximum temperature on the upper side is 39.1 °C / 102 F, compared to the average of 35.8 °C / 96 F, ranging from 22 to 57 °C for the class Subnotebook. (-) The average temperature of the palmrest area of similar devices was 28.6 °C / 83.5 F (-5.3 °C / -9.5 F). Both of the mini-speakers above the keyboard provide a nice sound that is however rather thin from time to time. At a moderate volume enjoying music is more than possible, yet the louder the volume, the more obvious the problems become with the overall tone. However, assuming a suitable headset or pair of earphones are used, the 3.5mm stereo jack provides very full-sounding tones. The LG P310 Camini is equipped with a 57.7W Lithium-Ion battery. However, on the underside of the unit there isn't much room left to play with when it comes to potential battery upgrades. 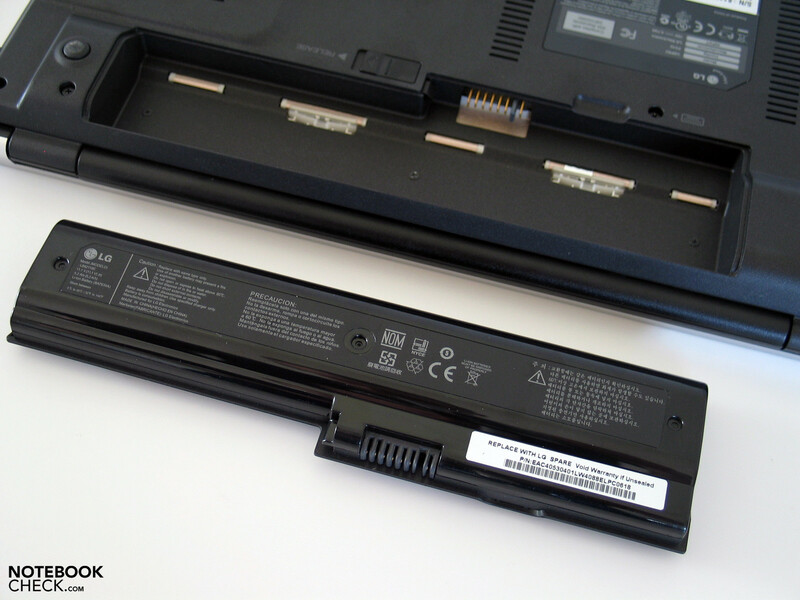 In fact, to date LG offers no possibility to upgrade the battery. In the tests we carried out on battery life the P310 fared quite favourably. The unit achiced a maximum battery life of 207 minute in the BatteryEater Readers test in energy-saving mode (minimum display brightness, WLAN off, energy-saving profile). In Office mode with maximum screen brightness and WLAN enabled, the unit achieved only a slightly lower 182 minutes. Under load in the BatteryEater Classic Test (maximum brightness, high-performance profile, WLAN off), the LG P310 achieved 82 minutes. Here the high power-consumption of the graphics card lets the battery life down. The results were somewhat similar copying a DVD with the external opitcal drive. In energy-saving mode with maximum screen brightness and deactivated WLAN we observed a battery life of only 110 minutes. 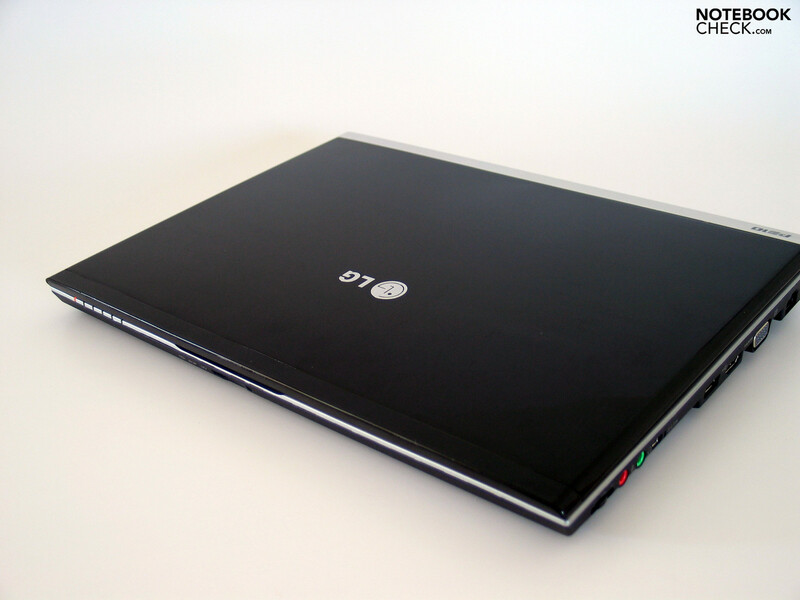 Admittedly the LG P310 raised our interest because of the Nvidia Geforce 9600M GT graphics card but the notebook in question is also attractive for a number of other reasons. This is true, in our opinion, for the extremely attractive case, which is good not only because of its aesthetics but because it offers the unit good stability. It is only with the positioning of the individual interfaces that we weren't pleased with. Also the keyboard fared well in our review, which as well as being visually pleasing offers a considerable comfort when typing. Even long periods of typing are possible with this device. The Touchpad offers a worthy alternative mouse with exception of the continuous bar of buttons, which can be mastered within a short period of time. Our summary of the 13.3 inch Display is somewhat ambiguos. On the one hand we like the good brightness of the backlight LED display, on the other hand we didn't like the low contrast values as well as the reflective display. 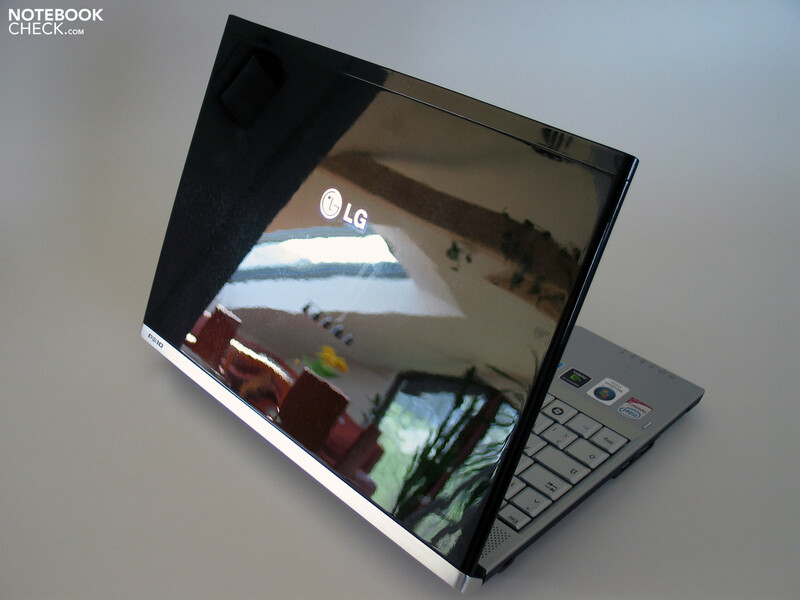 Despite classification as a "business notebook", there is no matte display option available for the LG P310. This is a shame, especially if you'd want to use the system outside. The P310 remains almost free of criticism in terms of performance. 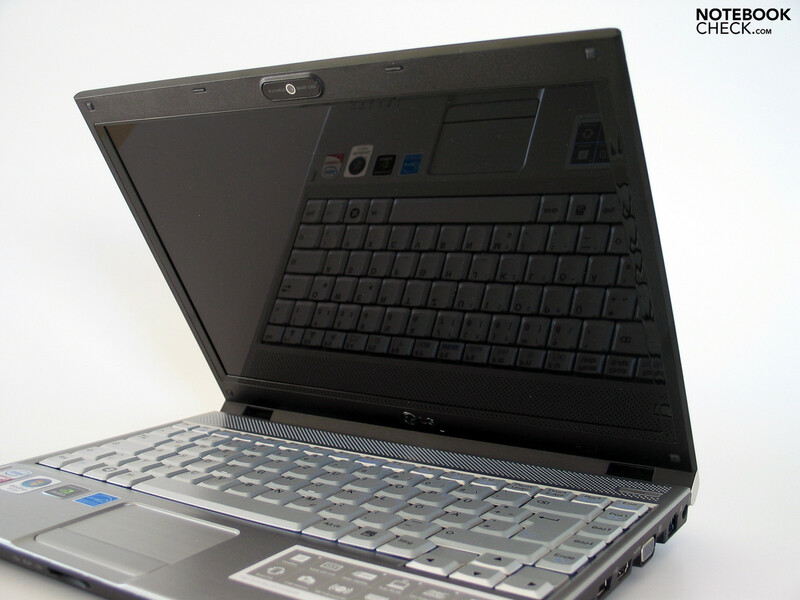 With a P8400 or a P9500 CPU in the more powerful Tarsia model, as well as the high-performance Nvidia Geforce 9600M GT graphics card, the notebook does not fail to deliver whilst the competition in the market for multimedia notebooks turn green with envy. The question arises whether any other competitors can produce a comparable configuration or do they simply dare not to? A discussion about the usefulness of a comparable device on the market is in our opinion necessary. That the fans whirr constantly and the surface temperatures become relatively high is not surprising. This is the price that you have to pay for such performance in such a compact device. Speaking of price, at about 1400 Euro for the Tarsia you enter into the high range of multimedia equipment, in which even more powerful gaming machines, such as the MSI GT627 with a quad-core CPU and Geforce 9800M GT are to be found. But of course, you didn't even want to play games on the P310, or did you?! LG packs the P310 into an attractive casing, which attracts attention mainly because of its performance. Even in use the keyboard impresses. With a clear layout and a very pleasant feel to the keys, extensive written assignments are no problem. 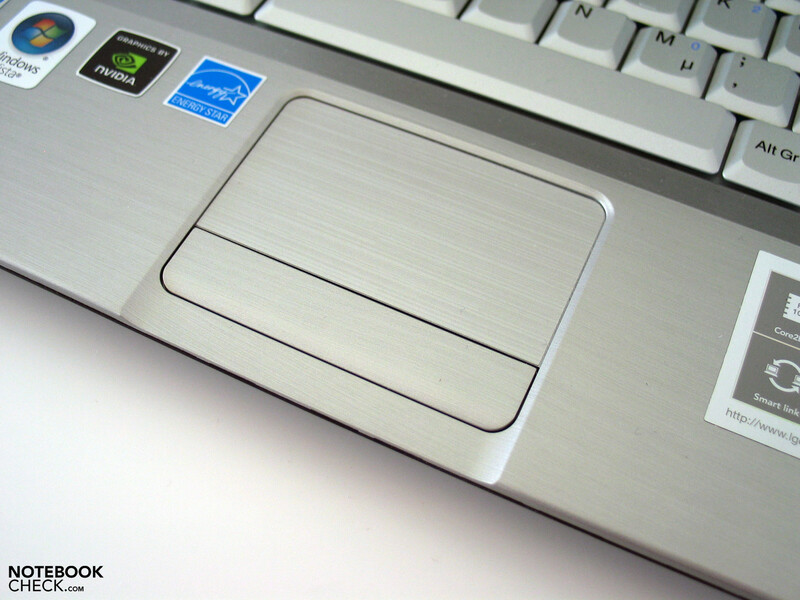 The Touchpad also fares well, apart from the continuous bar of buttons which requires a short acclimatization period. ...but is admittedly weak when it comes to contrast and makes working outside difficult. However the device performs considerably well with resource-intensive applications. Equipped with an Intel P8400 or a P9500 CPU and a Geforce 9600M GT graphics card, the P310 puts even some of the larger multimedia rigs in the shadows. 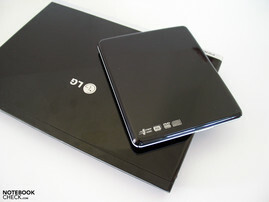 The device is supported by modules of DDR3 RAM and a hard drive of 250GB or 320GB. The fans are always at play, whether the system is idle or not. Also the high surface temperatures reflect the high-performance orientation of the components. Unfortunately the sound quality is let down like many Subnotebooks by thin and weak bass tones. Even the keyboard is visually pleasing and adds to the feel of the laptop. 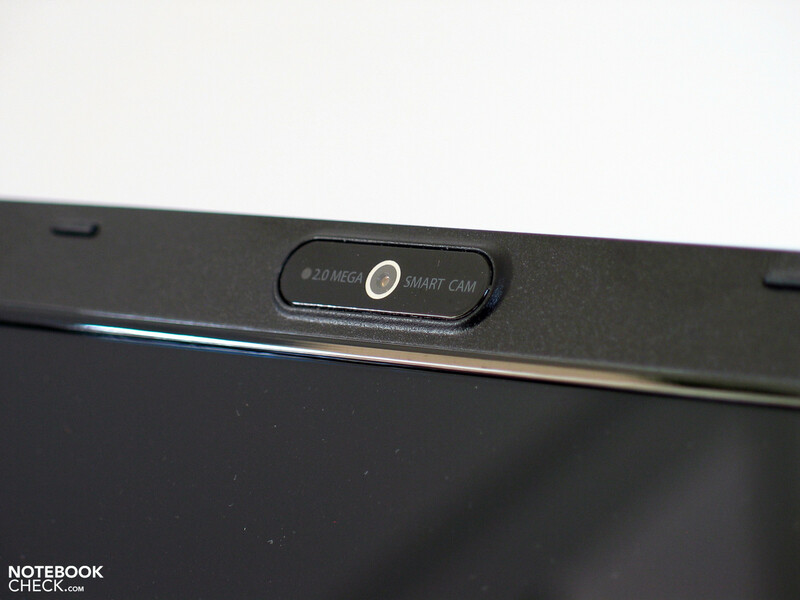 Even a 2.0 megapixel webcam comes as standard. ...which make for interesting viewing angles in the right lighting condition. However the P310 doesn't only win people over by its looks. ...for example aluminium, magnesium and plastic. An Aluminium rear attracts the eye. The hinges give a robust impression, but don't prevent the display from swaying a little. The provided interfaces are concentrated on the right-hand side of the case. Here you'll find a fully digital HDMI output to connect to an external monitor. The specifications can be seen. 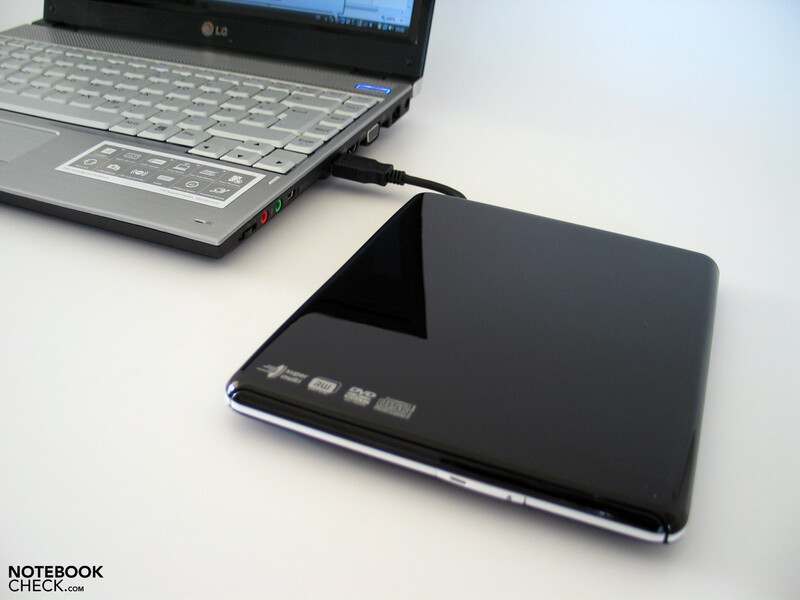 The device offers a gigabit Lan, WLAN AGN and Bluetooth V2.0. With a battery life of up to three hours the LG P310 is considerably mobile, enough so to work once in a while away from the plug. Manufacturer's information for the test device (in German) and slightly different P310 model in English. Gaming Power in a 13.3inch package, leaving aside the question of actual usefulness if that's ok? 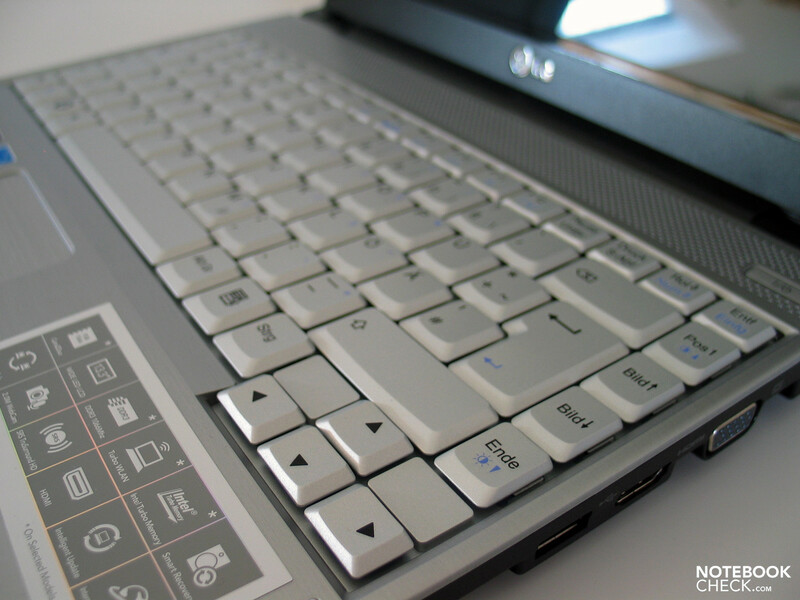 If the LG P310 wants to be taken seriously as a Business Notebook, it can't afford to lack a matte display option. Luckily glare panels are fortunately still an outright no-go. 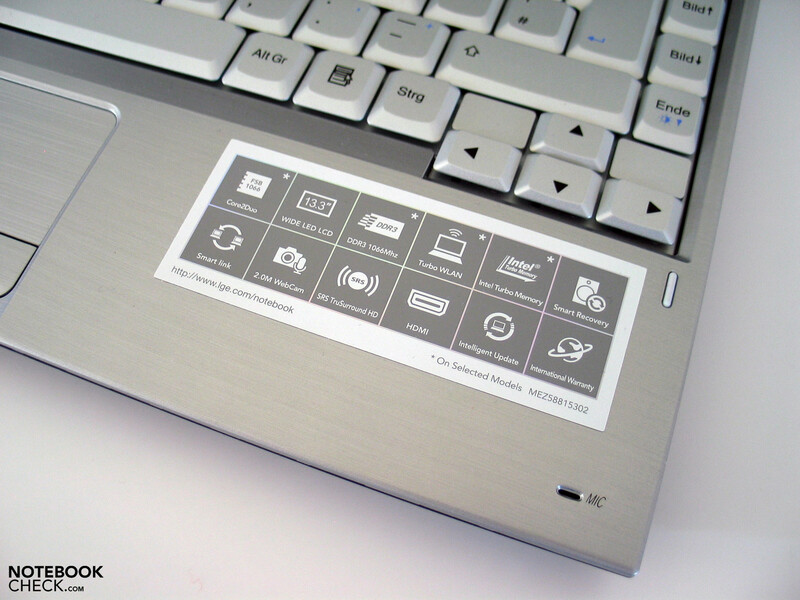 Also integrated UMTS would be a good idea for a business notebook in such a compact device. Not even a year has passed since the Geforce 9600M GT was a casual-gamer only graphics card. Now you'll find the chip in a 13inch model. This was probably a last minute addition to the device. 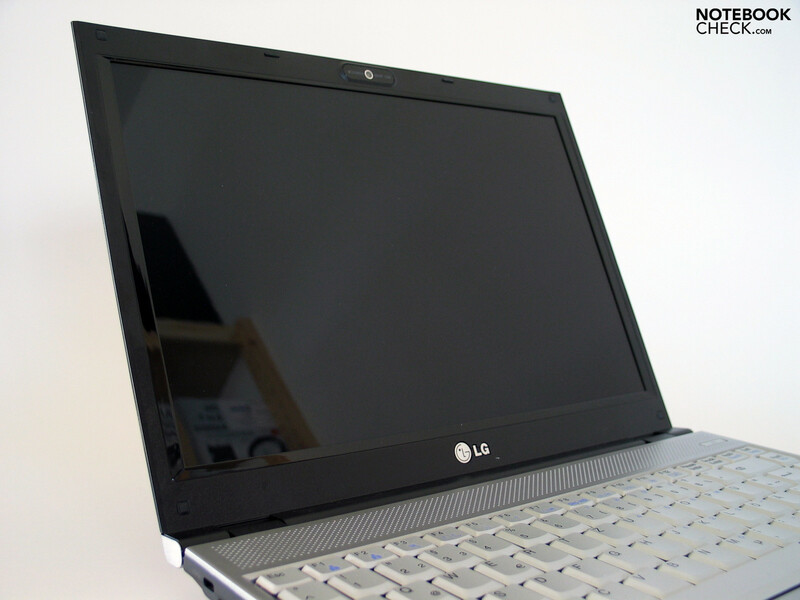 There are a number of powerful 13inch notebooks, such as the Dell Studio XPS 13Review Dell Studio XPS 13 Notebook or the new Apple MacBook 13", however none of these come close to beating the LG P310's 3D performance. An exception, whilst 'getting by': is the FSC Amilo Sa3650 with an external graphics booster.